Cameras that will not self-destruct when seriously wet are not new, but some are better at taking a good soaking than others. The real deal, however, is a camera that will keep on working when completely submerged. The machismo of these Commando-style cameras is measured by how deep you can take them beneath the brine. As any swimming pool diver will know, water pressure builds up fast as you head below the surface. 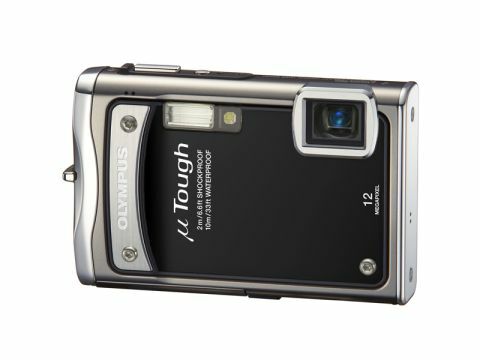 The Olympus µ Tough 8000 can hold its breath and keep on shooting at depths of up to 10 metres. This makes a great gadget for surfers, sailors, snorkellers and accident-prone holidaymakers – but its real attraction is that it does not look like an out-and-out diver's accessory. It's not painted bright orange or yellow – it comes in blue, black or silver. The Tough lives up to its name, as everything feels solid. The connector and battery covers are heavy duty affairs, and the shell is reassuringly metallic. And it's not just styling; Olympus says it can be dropped from a height of 2 metres or bear a 100kg weight, without caving in. Despite this, the controls are too dainty for extreme conditions. The buttons would be hard to operate underwater or in a blizzard, and the menu system is hard to navigate. The core features are well-suited to the outdoor life. The 3.6x zoom has a wide end (equivalent to 28mm on an old film camera). The close-up facilities are also top-notch. With limited visibility underwater, close focusing is essential if you're going to get good-looking pictures of marine life. There are three modes to do this; one uses an LED torch to light up the subject and aid focusing. Image quality is reasonable, with a decent amount of detail and pleasing colours. Olympus gets extra points for supplying Mac-compatible software out of the box (OS X 10.3 or later). Master 2 has some rather useful image editing tricks up its sleeve.